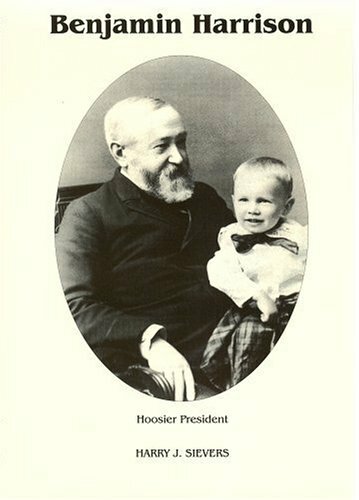 “Benjamin Harrison: Hoosier President” is the final book in a three-volume series by Harry J. Sievers. Published between 1952 and 1968, this series provided the first major biographical review of Harrison and remains the most comprehensive and detailed analysis of his life ever published. In addition to being Harrison’s primary biographer, Sievers was a Jesuit priest and most recently served as Dean of the Graduate School of Arts and Sciences at Fordham University. He died in 1977. This final volume in the series covers the last dozen years of Harrison’s life beginning with his one-term presidency. It also encompasses the death of his first wife, his unsuccessful bid for re-election, his second marriage (to the daughter of his deceased wife’s sister, no less), his return to the practice of law and his death. Like the two earlier volumes in this series, the final volume is descriptive, easy to read, well organized and extensively documented. Chapters are arranged topically, but only during Harrison’s presidency does the flow break appreciably from chronological order. Even then, the author’s approach is so logical that the break from a strict timeline is rarely confusing. With 277 pages, “Hoosier President” is the shortest of the three volumes in this 1,000-page series. But only about half of this volume’s pages actually focus on Harrison’s presidency. The balance of the book covers the selection of his Cabinet, his family’s move into the White House, his inauguration, his campaign for re-election and his retirement from politics. Given the author’s proclivity for following Harrison day-to-day in previous volumes, I was fearful this final volume might become bogged down in the kind of presidential tedium that only Ben Harrison’s administration could offer. Instead, by the book’s end I almost wondered if I had accidentally skipped over one or more of the chapters covering his presidency. Although I encountered less of the drudgery than I had expected, I also seemed to witness less of his administration, period. The essence of a great presidential biography is the energetic and thorough dissection of a presidency, along with the analysis and judgement that leaves an indelible impression upon the reader. But that spark is missing from this volume. In hindsight, it feels as though the author completed this volume out of a fatigued sense of obligation rather than with enthusiasm or passion. By the time he completed the series, of course, he had been engaged in this extraordinary effort for nearly twenty years. And unlike most biographers, Sievers had no previous biographical infrastructure on which to build – he was carving a fresh path. But where biographers Flexner (Washington) and Malone (Jefferson) seemed to relish the last steps on their multi-volume journeys, “Hoosier President” exudes an unusual sense of relief…that the end has finally arrived. I finished this book (and, thus, the series) feeling a personal connection with Harrison himself, but with little sense of his presidency or political legacy. I am left wondering whether Harrison’s presidency can be deemed at all successful, and how history should remember this often-forgotten president. Overall, “Benjamin Harrison: Hoosier President” is a somewhat disappointing conclusion to an extremely worthy three-volume series on Benjamin Harrison. Harry Sievers deserves enormous credit for crafting the first-ever comprehensive account of Harrison’s life; it is a feat that has never been matched. But while the first two volumes were delightfully interesting and informative, “Hoosier President” feels like the work of an author keen to reach the finish line.